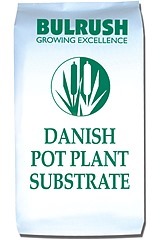 Our Danish Pot Plant Substrate has been developed using an open structured peat with added clay granules. It is ideal for planting up to 9cm to 13cm pot plants and is very useful for salt sensitive species. Low nitrogen versions of both the above mixes are available to suit production of pansies, primroses and any other crop requiring control of vegetative growth to produce the required plant habitat.